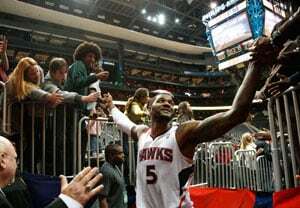 Josh Smith scored 31 points and Al Horford added 22 as the Atlanta Hawks beat the Detroit Pistons 126-119 in double overtime on Wednesday after blowing a 22-point fourth-quarter lead. Detroit reserves Will Bynum and Charlie Villanueva scored a combined 26 points in the final period of regulation to spark the Pistons' comeback and force overtime. Atlanta has won two straight and eight of 12, while Detroit has lost seven of nine. Bynum finished with 31 points and assisted on the last two baskets of regulation, when Andre Drummond's dunk cut the lead to two and Austin Daye's 3-pointer gave the Pistons a 101-100 lead with 4 seconds remaining. Horford followed by making just one of two free throws for the Hawks, sending the game to the first overtime. Jeff Teague hit a 3-pointer with 2:46 remaining in the second overtime to put Atlanta ahead for good. The Miami Heat avoided a letdown a night after an emotional win over Oklahoma City, beating the lowly Charlotte Bobcats 105-92. LeBron James had 27 points, 12 rebounds and eight assists and Dwyane Wade added 29 points and nine rebounds as the Heat handed the Bobcats their 16th straight loss. Heat coach Erik Spoelstra hinted before the game he was worried about how much energy Miami expended in its close win over the Thunder on Christmas and whether they would play hard against a team that had lost 15 straight. Kemba Walker had 27 points for the Bobcats, who haven't won since November 24. The Denver Nuggets overcame a 40-point effort by Kobe Bryant to beat the Los Angeles Lakers 126-114 for their seventh straight win at home. Corey Brewer matched his career high with 27 points, Kenneth Faried had 21 points and 15 rebounds, and Danilo Gallinari added 19 points for Denver. Bryant has scored at least 30 in 10 straight games, but it wasn't enough to keep the Lakers' five-game winning streak from being broken. Pau Gasol added 19 points for the Lakers and Steve Nash had 15 points in his third game back from injury. The Houston Rockets rallied for their fifth straight win, beating the Minnesota Timberwolves 87-84. James Harden scored 17 of his 30 points in the fourth quarter, including a drive to the basket that gave Houston an 85-84 lead with 39 seconds left. J.J. Barea had 18 for Minnesota and Russian rookie Alexey Shved added 16. Kevin Love had 12 rebounds, but scored just seven points on 3 of 14 shooting. San Antonio ended Toronto's five-game winning streak, using a balanced attack to beat the Raptors 100-80. The Spurs had five players in double figures, led by Tim Duncan with 15 points and Manu Ginobili with 14. Duncan had six rebounds and was 6 for 11 from the field in only 20 minutes. San Antonio's starters outscored their Toronto counterparts 54-25. The depleted New York Knicks edged the Phoenix Suns 99-97 when J.R. Smith sank a baseline 21-footer at the buzzer after a Phoenix turnover with a second to play. Smith made a tough jumper from 15 feet to tie the game at 97 with 10.6 seconds left. Then, after the turnover, Jason Kidd inbounded to Smith, who got the shot off as he sailed out of bounds. Smith scored 27 and Kidd 23. New York was without the NBA's No. 2 scorer Carmelo Anthony (hyperextended knee) and Raymond Felton (finger), both hurt in the Christmas day loss to the Lakers in Los Angeles. In Milwaukee, the Bucks beat the short-handed Brooklyn Nets for the 13th straight time, 108-93. Brandon Jennings scored 25 points and Monta Ellis added 20 points and a season-high six steals to lead the Bucks. Brook Lopez had 21 points and 10 rebounds for the Nets, who fell to 3-10 in December. The Nets were without starting guard Deron Williams, who injured his wrist in a fall during Tuesday's loss to the Boston Celtics. Led by Dorell Wright's season-high 28 points, the Philadelphia 76ers ended a six-game road losing streak with a 99-89 win over the Memphis Grizzlies. Spencer Hawes added 20 points and Thaddeus Young and Jrue Holiday each had 13 points for Philadelphia. Zach Randolph led the Grizzlies with 23 points and nine rebounds. Memphis played without leading scorer Rudy Gay, who was absent for "personal reasons." Golden State continued its surprising season with a 94-83 win over the Utah Jazz on the road. Stephen Curry had 23 points, eight rebounds and seven assists, and David Lee added 18 for the Warriors, who dominated on the fast break and hit 9 of 18 3-point attempts. The Portland Trail Blazers avenged a loss at Sacramento on Sunday by beating the Kings on their home court 109-91. LaMarcus Aldridge led the way with 28 points and 12 rebounds, while Nicolas Batum scored 18 points and J.J. Hickson added 17 points and 14 rebounds. Tristan Thompson's three-point play with 24.4 seconds remaining gave Cleveland its first two-game winning streak of the season as the Cavaliers beat the Washington Wizards 87-84. Washington, which has lost eight straight, fell to an NBA-worst 3-23. The New Orleans Hornets, with the NBA's second-worst record, edged the Orlando Magic 97-94 to end an 11-game losing streak. Robin Lopez scored 29 points and Greivis Vasquez added 27 for the Hornets, who last won on Dec. 3. The Chicago Bulls-Indiana Pacers game was postponed due to a winter storm in the Midwest.